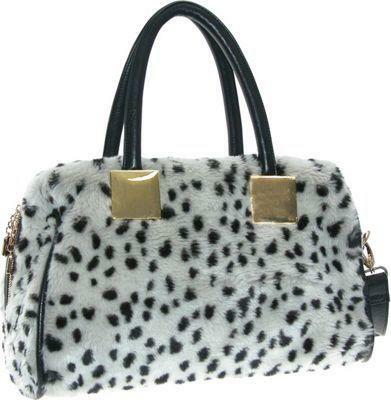 Add texture and interest to any outfit with this faux snow Leopard satchel from Adrienne Landau. The Adrienne Landau Snow Leopard Satchel is crafted from faux fur with an allover snow leopard design and features contrast faux leather accents and trim, gold tone hardware, two rounded top handles, and an adjustable, detachable shoulder strap that makes it comfortable to carry. This satchel has a large main compartment with a zip top closure and a fully lined interior that offers plenty of storage for all of your essentials. The interior includes a back wall zipper pocket and two multipurpose slip pockets to hold small items and accessories in place.